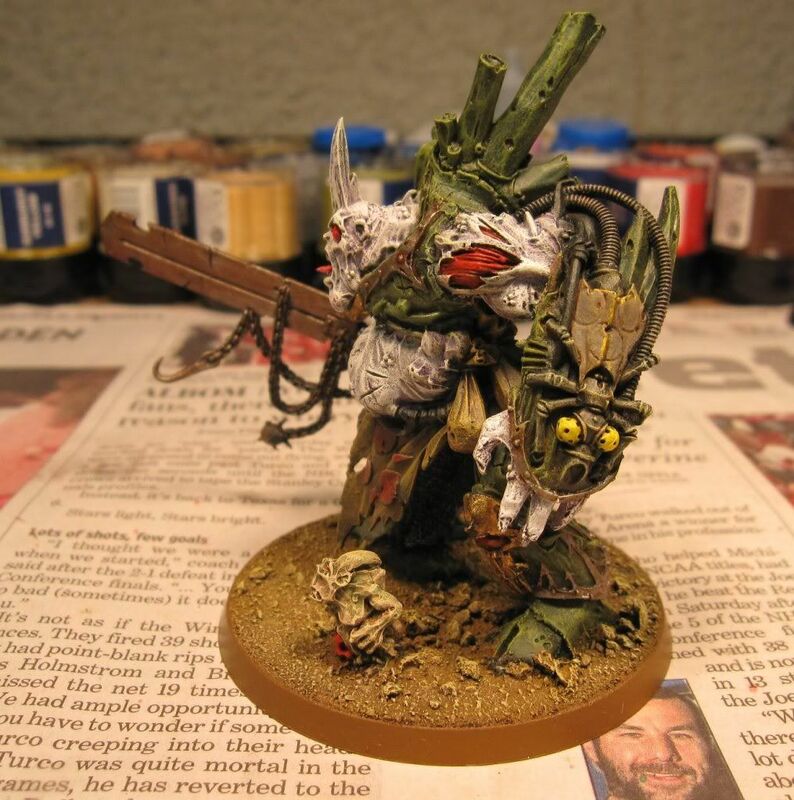 I have finished my Daemon Prince of Nurgle. 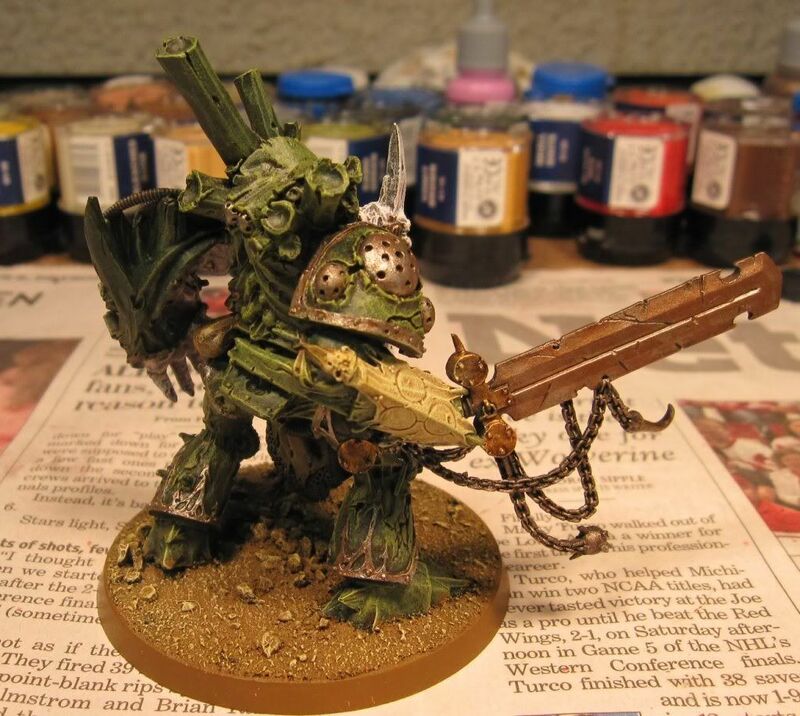 He will be used in both my Chaos Daemon and Death Guard Armies. I was unable to get my Death Guard Daemon Prince and Epidemius completed this week but I did make good progress on both of them. The DP is about 90% complete and Epidemius is about 70%. 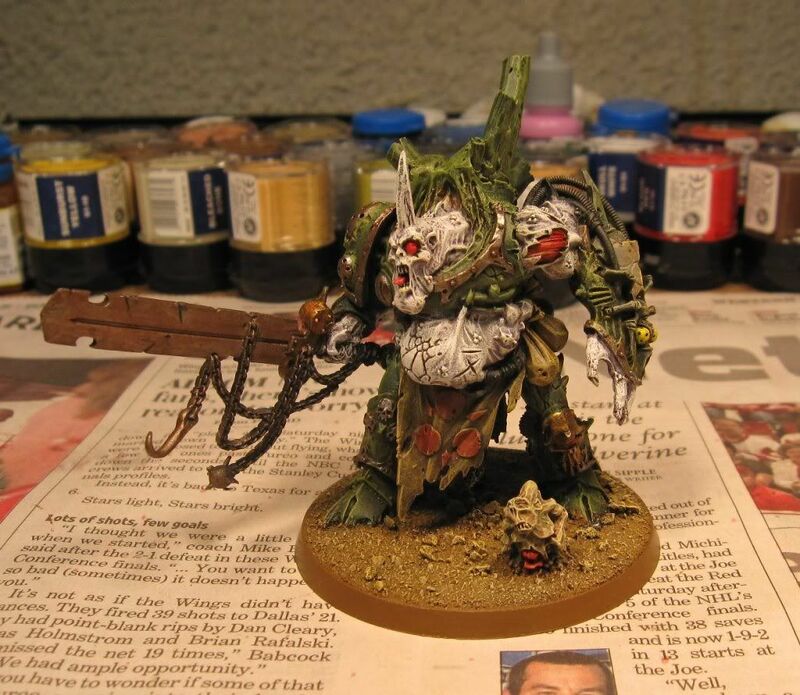 I have yet to start on my remaining Plaguebearers, although I did start painting a Death Guard Sorcerer in between painting the DP and Epidemius. To be honest, I think I got too ambitious with my project list to start with. The DP and Epidemius have so much fine detail that they are taking much longer than originally thought. Having due dates on projects turns out was not a good idea. IMO, it takes the relaxing part out of the hobby, so I will no longer use them. The goal of the project list is simply to keep me focused on the projects that I have started in hopes I will complete them. I am very bad at starting a project and then starting on something else halfway through that project. I am sure this is a problem many gamers have. I am going to keep a running list in the sidebar with the completed date and potentially a link to a WIP picture or a picture of the completed project. Feel free to post a comment on how you stay focused on your projects. I have completed my four Beasts of Nurgle. I am finding it hard to concentrate on my daemon projects due to burnout, so I have tried working on some other stuff. I have completed the final touches on a squad of Death Guard CSM. 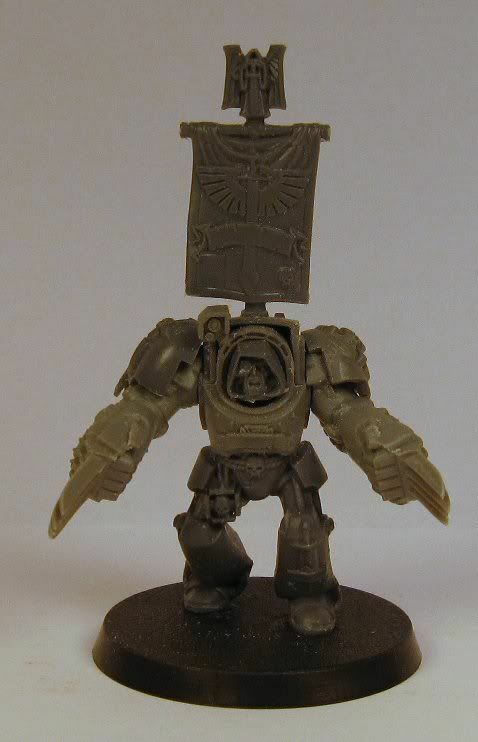 I have also started working on getting my Dark Angel army playable under the new vanilla Space Marine Codex. 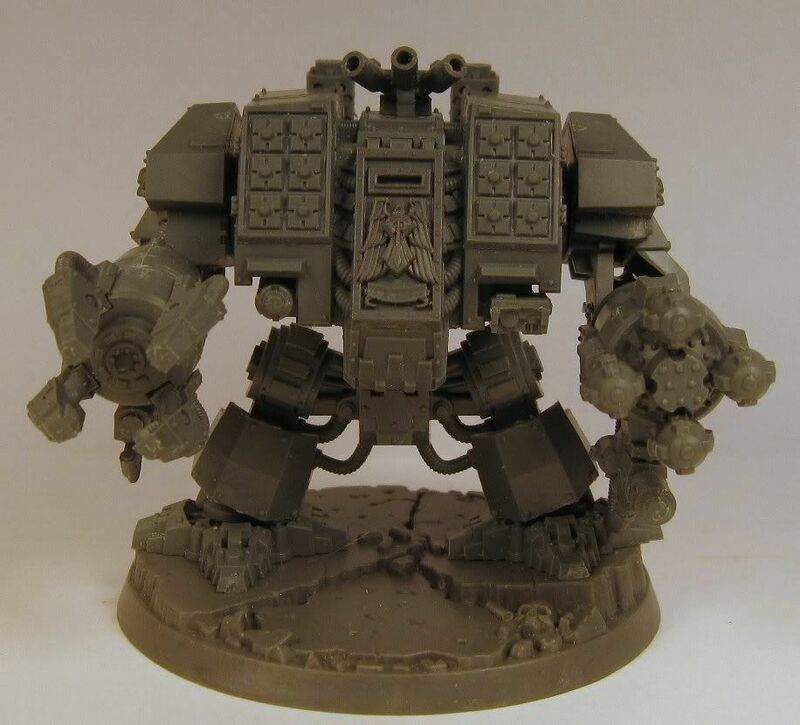 First is a Dark Angels Venerable Dreadnought. 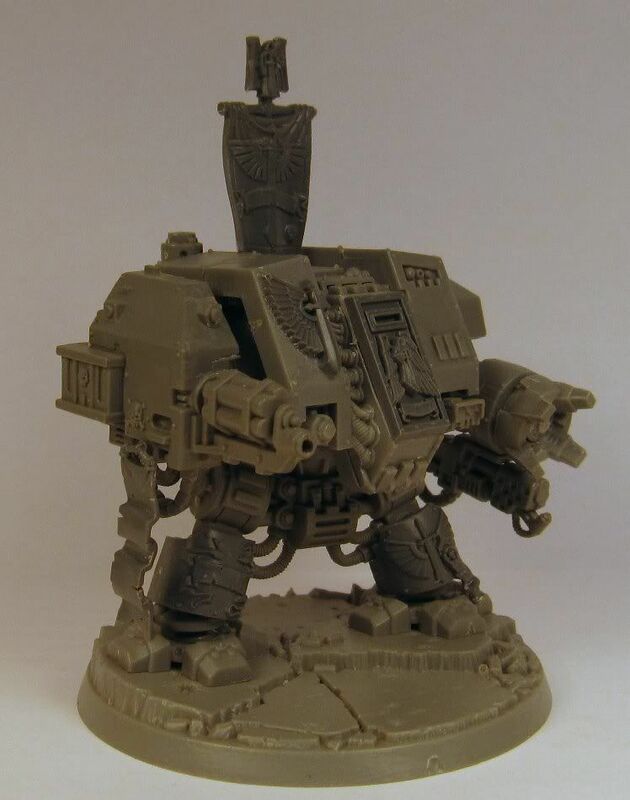 Finally, a Deathwing Assault Terminator Sergeant. My goal is to have Epidemous, the DP, and the Beasts of Nurgle done by 10/25 as I have already started painting them and it should be quick work to finish them. The 15 plaguebearers are primed and I am targeting them to be done by 11/01. The Temple of Skulls, my favorite terrain piece at the moment, is partially painted and I will try to have that done by Sunday 11/08. I am trying not to be too ambitious to begin with since failure to complete the projects my kill the whole project list. 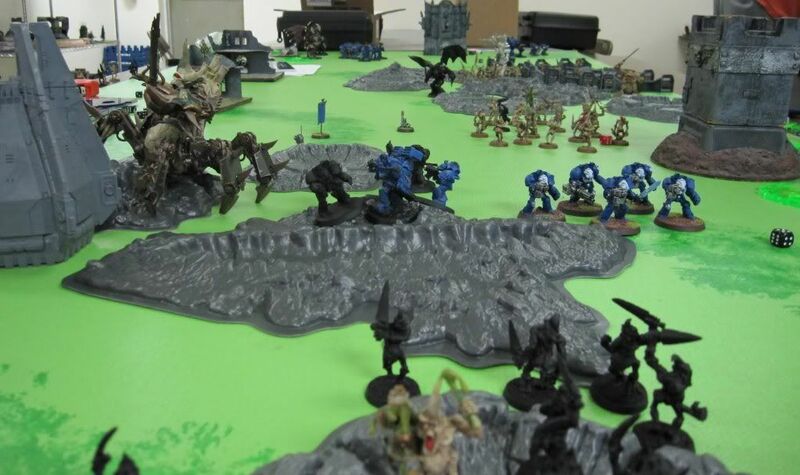 The game happened on Saturday and it was the Planetstrike Seize and Destroy Mission where the attacker has to hold the center objective without it being contested by the defender. A very hard mission for the attacker to win IMO. We played 2500 points per side. I did not take notes again but I will write what I can remember. Not all the pictures turned out good, but I have some good ones. There were three objectives, but only the center bastion really counted. 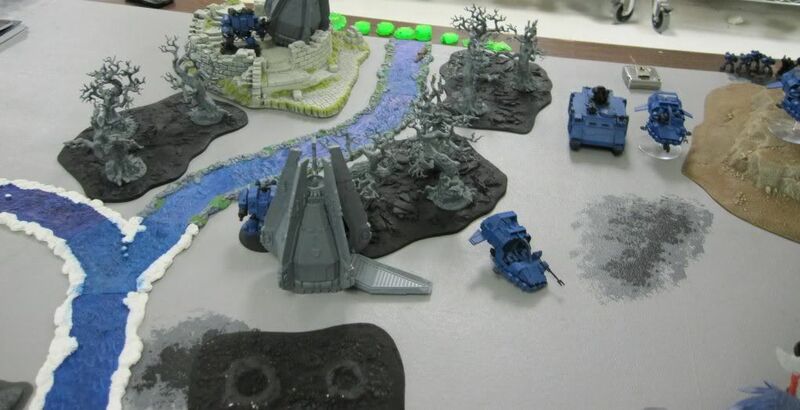 My Stratagems were Ground Observer and Dawn Assault. My opponent took Krak Attack, Force Pylons, and Void Shield. I got a total of 8 Firestorm attacks, and since I was not able to target the center bastion, I went after the hammerheads hiding in the ruins. Unfortunately, nothing happened to them. I made my Daemonic Assault roll and got the half of the army I wanted (aka the Nurgle half) and reserve rolls for turn 1 were generous. I got everything but the Bloodcrushers and the Flamers. Turn 1 saw no Deep Strike mishaps, and I was fortunate to be able to get three assaults off on turn one. The Soul Grinder assaulted a small unit of Kroot guarding the center objective, the Beasts of Nurgle assaulted the Crisis Suits on the other side of the center bastion, and the Daemonettes assaulted a hammerhead. The Soul Grinder broke the kroot and wiped them out. 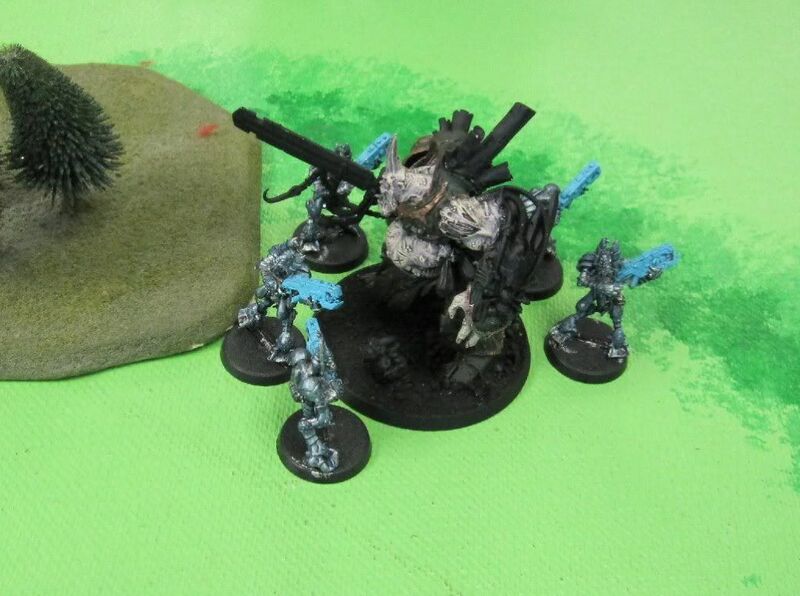 The Beasts of Nurgle rolled a 6 for their random poisoned attacks, giving them a whopping 49 attacks. The poor Crisis suits never stood a chance and were wiped out. The Daemonettes assaulted a hammerhead and wrecked it thanks to their rending claws. Turn one for the defender saw some of her reinforcements arrive. 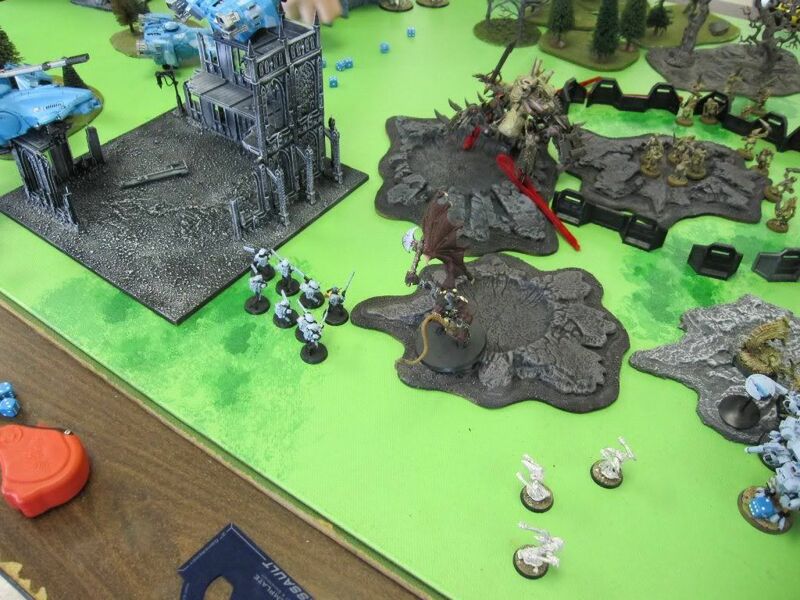 The Tau HQ Crisis Suits deep striked close to the ruins behind the Beasts of Nurgle. Then moved into it, forcing me to remove my Ground Observer Statagem. Although the Tau shot with everything they had, my army was mostly left intact. The Daemonettes were reduced to one model. 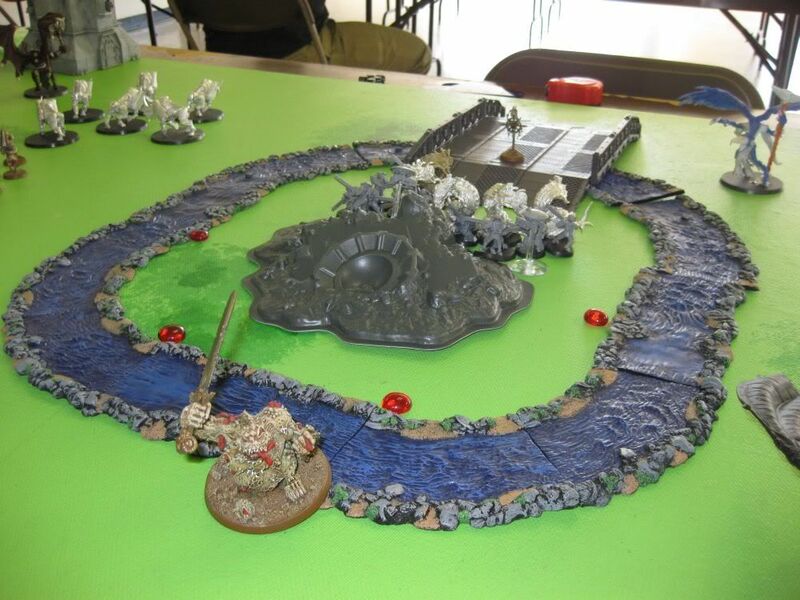 My second turn saw the arrival of the Bloodcrushers and the Flamers. The Bloodcrushers were very close to mishapping by arriving very close to a unit of Crisis Suits, but since I only took six, I was able to wrap them around and still be an inch away from the crisis suits. The Flamers arrived on the other side of the board losing three of their numbers thanks to an effective Krak Attack roll. 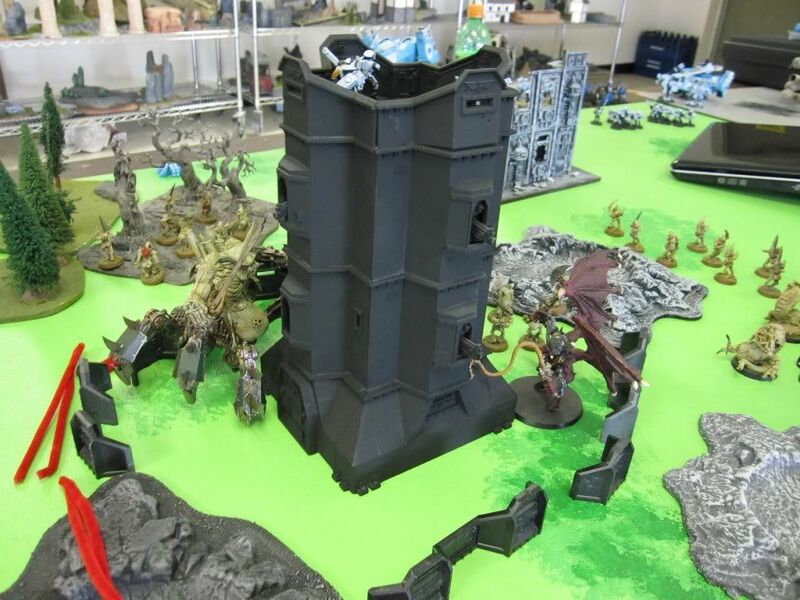 The Soul Grinder had its eyes on destroying the center bastion and moved towards it. 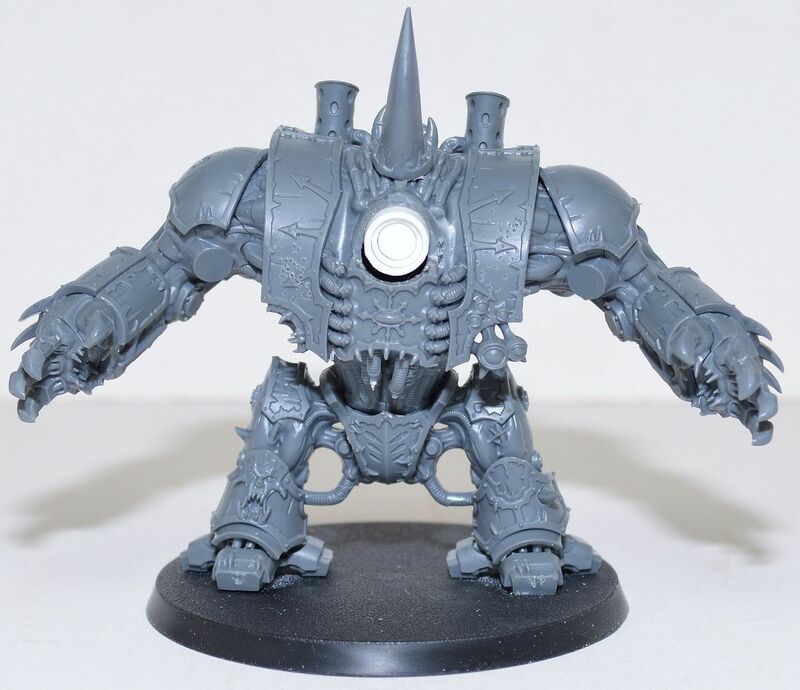 He vomited through the gun slit killing 4 of the Firewarriors within it. He assaulted the bastion, along with the Bloodthirster. The Bloodthirster was not needed as the Soul Grinder ripped through the bastion with ease. 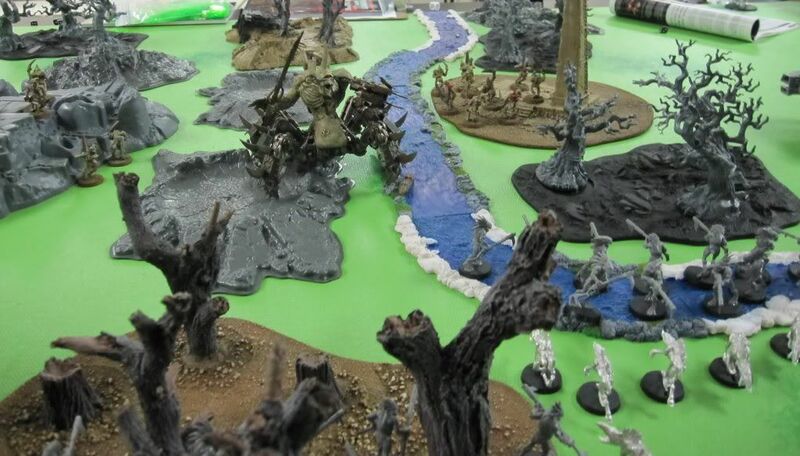 The Great Unclean One, the Beasts of Nurgle, and one unit of Plaguebearers, along with the remaining flamers who were close by, moved towards the ruins where the enemy HQ unit was hiding, attempting to box them in as much as they could since there was no way anything could assault them that turn. The Flamers used their Breath of Chaos killing one shield drone and wounding one of the crisis suits. 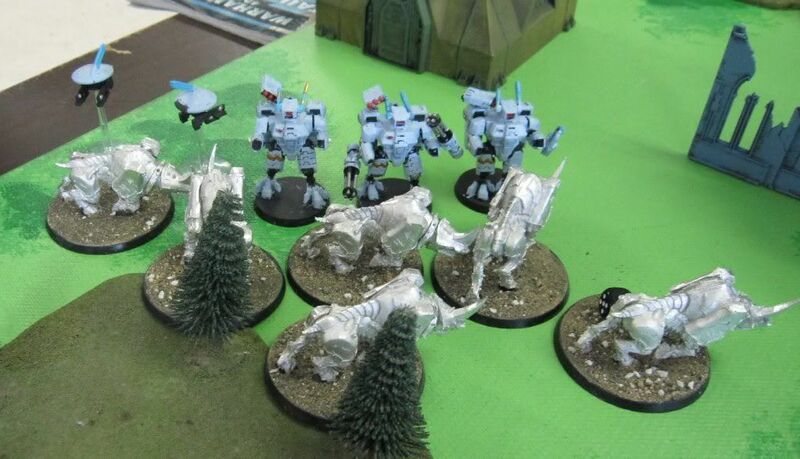 The Bloodcrushers assaulted the Crisis Suit unit that almost caused them to mishap. They did enough wounds to cause the Crisis Suits to break and then wiped them out. 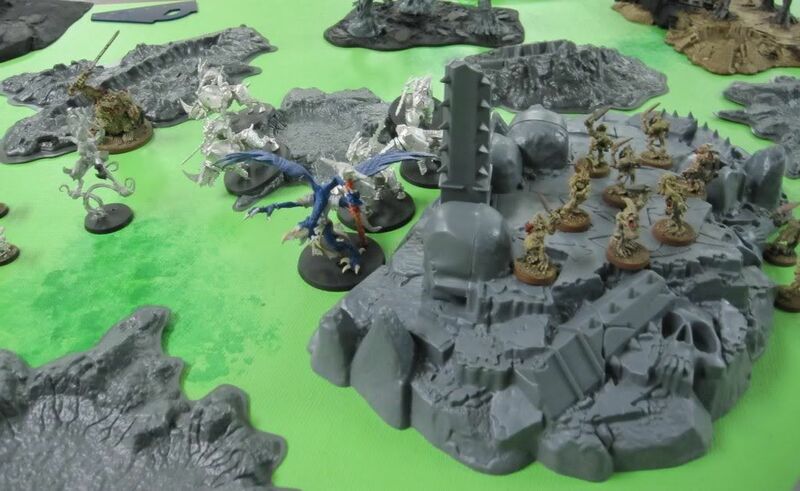 One of the Daemon Princes was able to assault the stingwings causing havoc on the flank and killed two, but the stingwings failed to wound the DP and they held their ground for this turn. The lone Daemonette assaulted a unit of two gun drones and destroyed them. 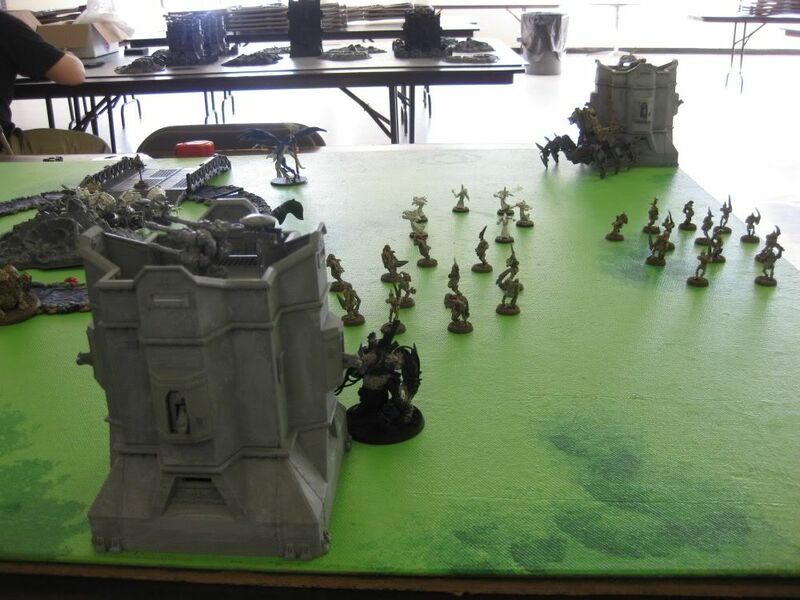 My opponents turn two saw the arrival of a third hammerhead and a unit of firewarriors both coming in on my dropzone. 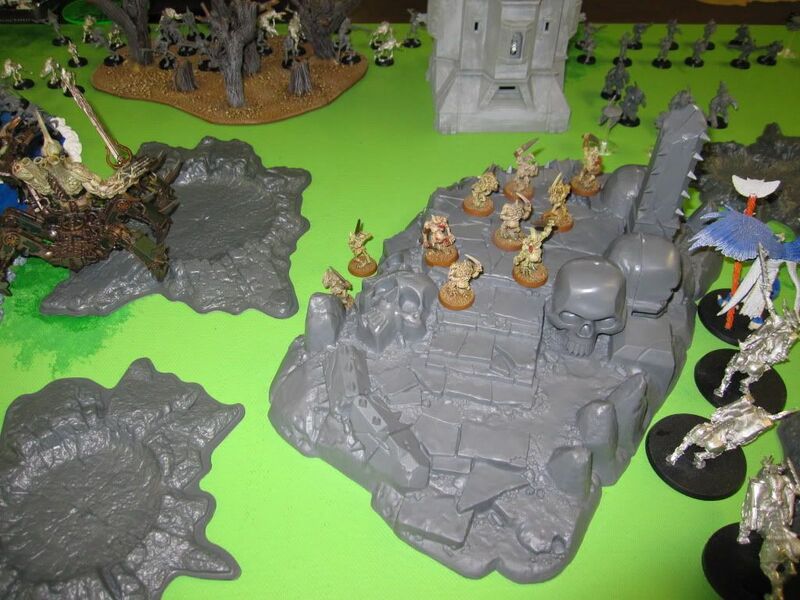 The HQ CS unit came out of the ruins and poured all their firepower into the Great Unclean One and were able to send it back to the warp. The tau poured almost everything they could into the Bloodthirster and remained unwounded thanks to lots of luck save rolls. The lone Daemonette was shot down and the DP not locked in battle got shot down as well. The other DP in combat with the stingwings killed a few more and was able to break the unit and wipe them out. 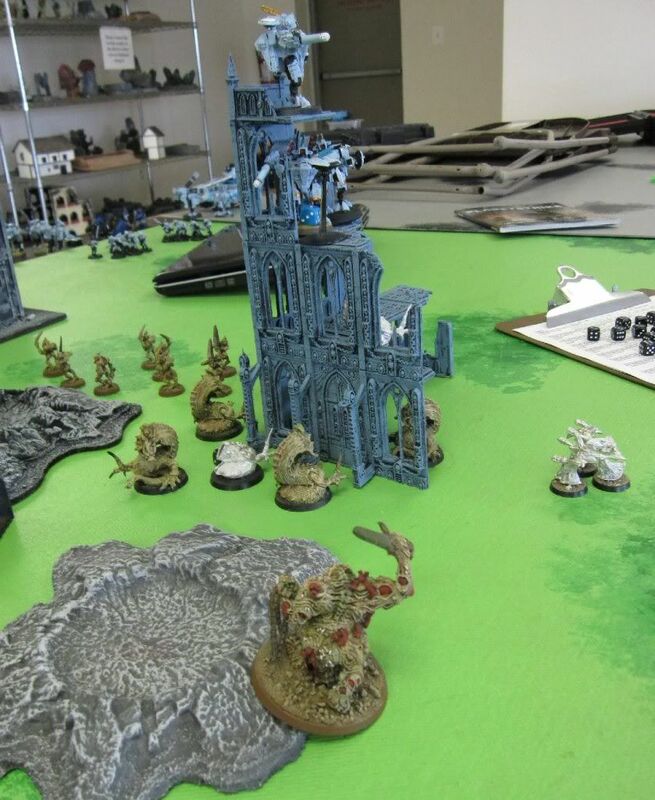 On turn 3, the Soul Grinder and the Bloodthirster moved away from the center objective in order to the let the Plaguebearers move in and clean up the remaining firewarriors. 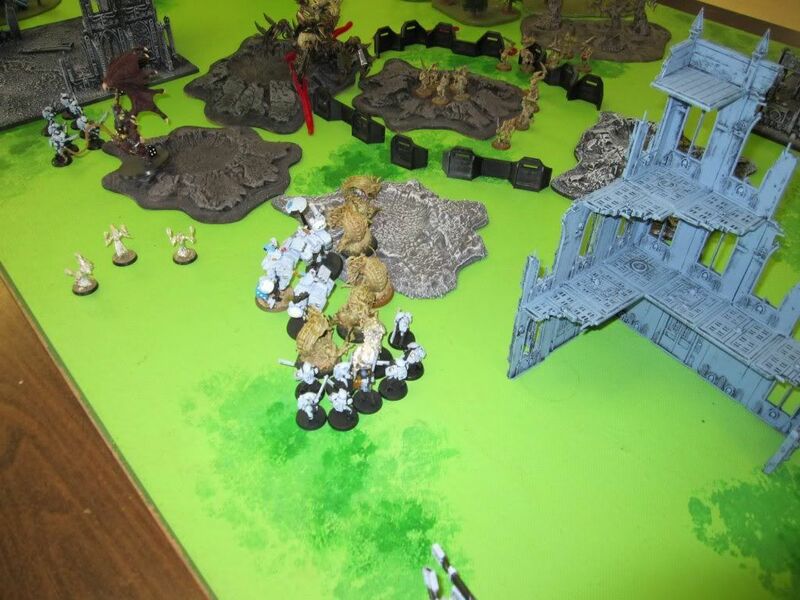 The Beasts of Nurgle moved towards the HQ CS unit that just killed the GUO and was able to assault them. Unfortunately, the BoN rolled a 1 for their attacks and actually managed to lose combat. My memory from here is vague especially since I stopped taking pictures for the last couple of turns. 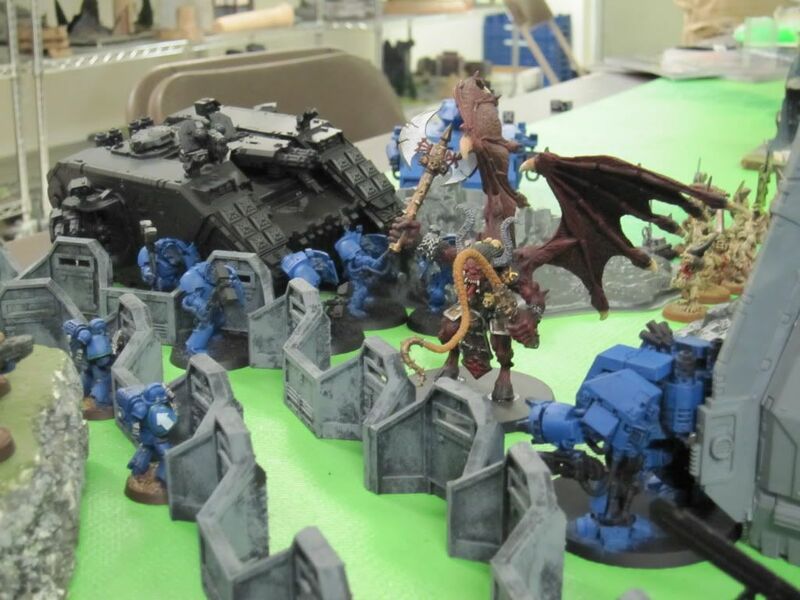 The Daemons managed to kill 95% of all Tau non-vehicle units and the Tau killed all the Greater Daemons (actually the Bloodthirster died when he lost his last wound by landing in difficult terrain). The game ended on turn 6 with three units of Plagebearers and the remaining two Beasts of Nurgle trying to destroy the 4 Tau tanks (3 hammerheads and a devilfish) that were contesting the center objective. Truth be told, I am starting to get burned out on my daemon army. I have enjoyed painting and playing them, and I will continue to work on them. However, I am going to start switching in projects from my other armies for some variety. 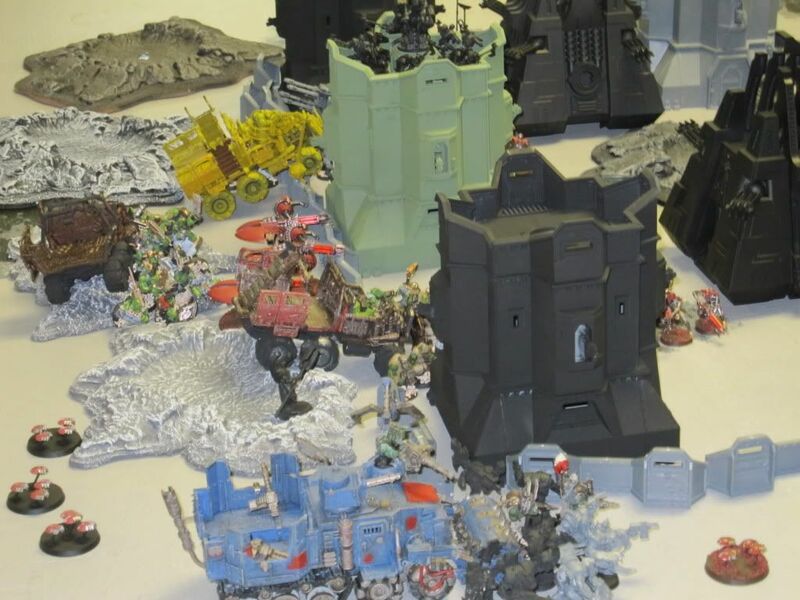 So I am remaking my blog to include all of 40k. The other armies I play include Orks (my personal favorite), Cadian IG (second favorite), Dark Angels SM, Iron Warriors CSM, and Necrons. I also have a small Death Guard CSM detachment. 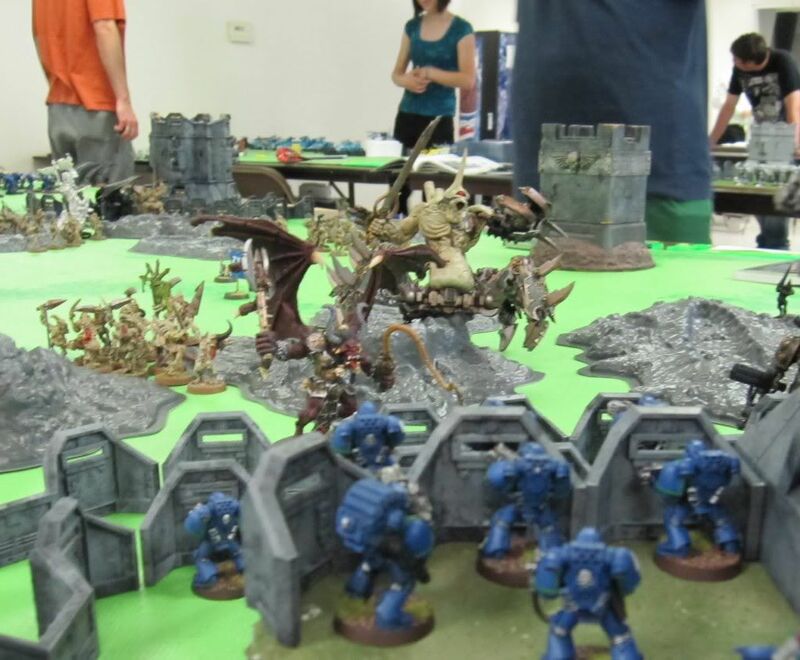 Rhellion came through again with pictures of my Saturday game. He was up at Pandemonium playing his PS league game the same day. Thanks Rhellion! 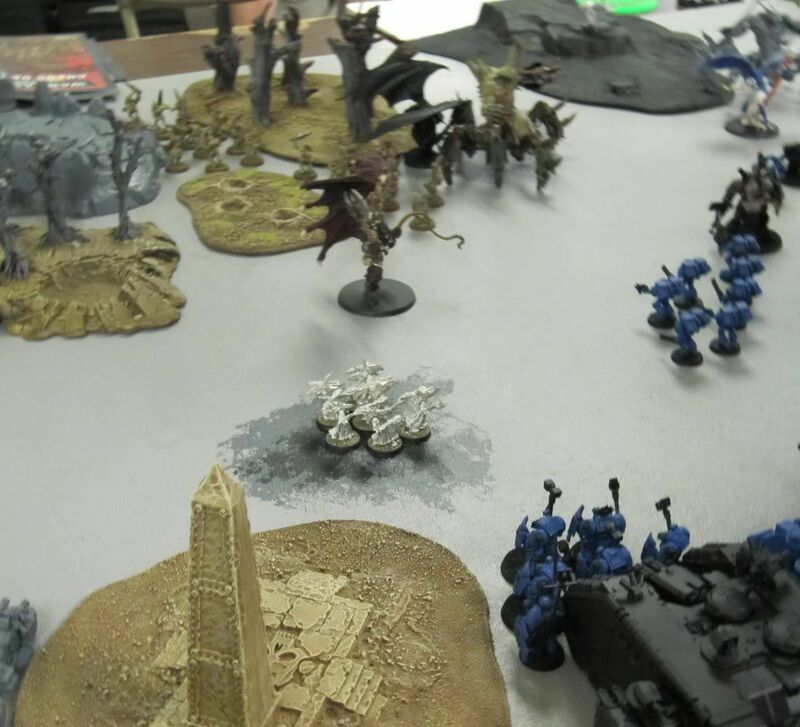 One of my chapter brothers, Rhellion, was kind enough to post a picture he took of my battle from last night. 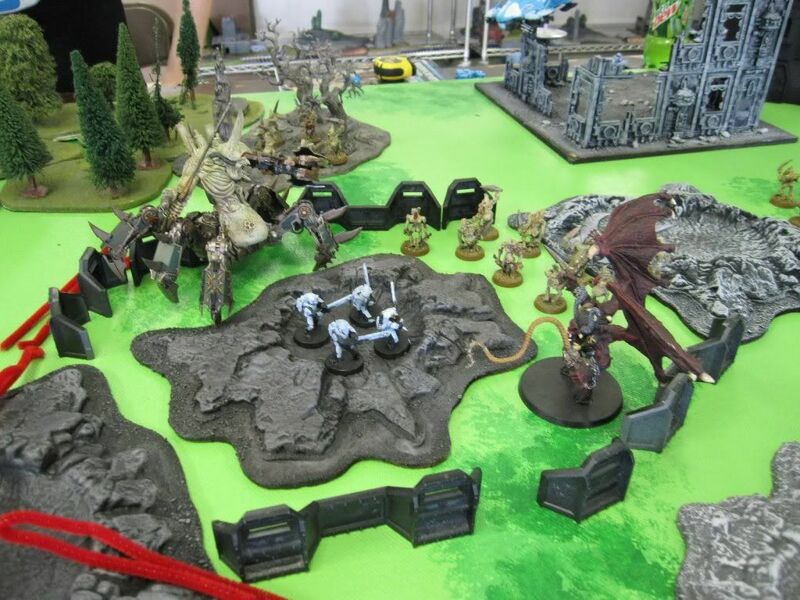 Last Saturday, I fought game two of Round 2 in the PS league. I was not able to take my camera to the game with me as the wife took it with her to the in laws with the kids, so I have no pictures to post. We fought the Desperate Assault mission with my daemons attacking and the Tau defending. 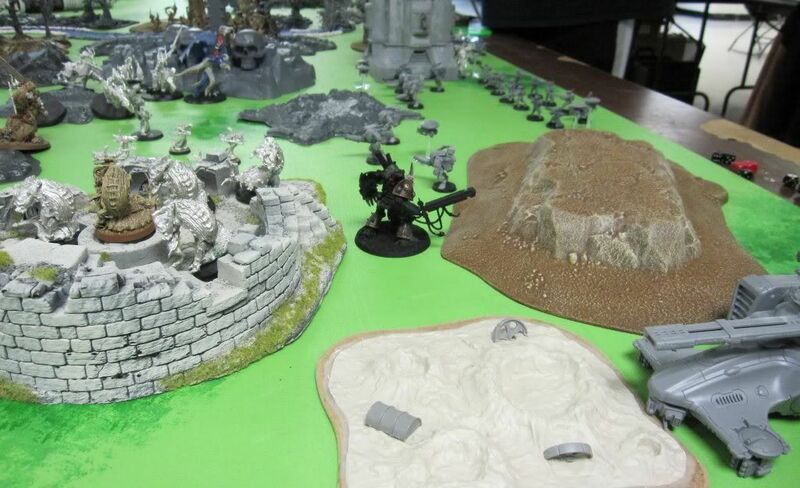 The game had five bastion/objectives, one in each corner and the last in the center of the table. I choose not to place the Beachhead objective. I made my 'Wrack and Ruin' roll and destroyed a bastion, and the Firestorm's only effect was destroying the bastion in the center of the table. 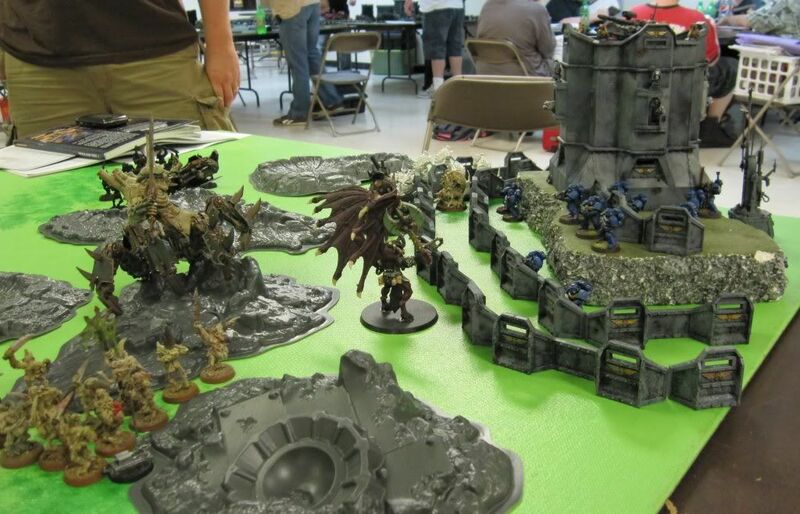 My stratagems included Darken the Skies, Ground Observer, and Confusion Reigns, which I uses to swap the 30 kroot in the central bastion with 12 firewarriors in one of the corner bastions. My opponent took Krak Attack (as all my opponents do), Ammo Store, and Laz-maze. My army arrived all on turn one (as it usually does in PS). 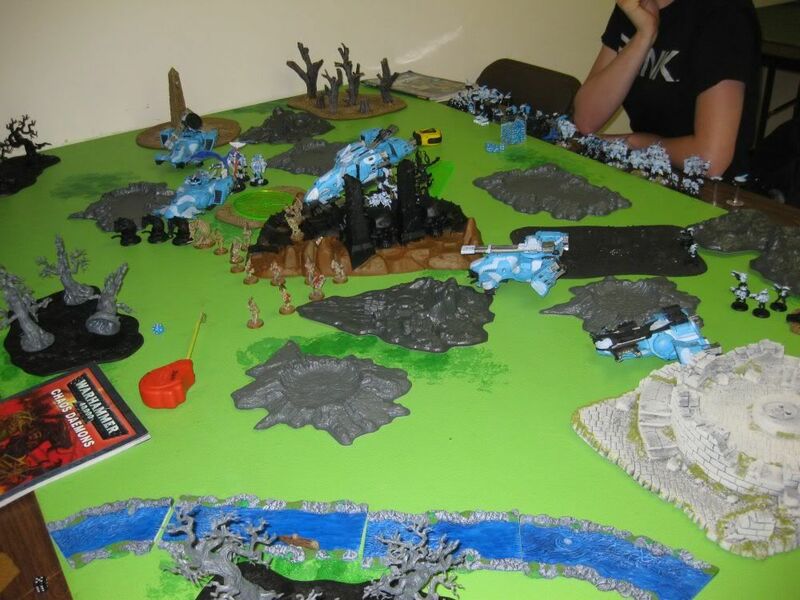 I do not remember any big highlights during the battle as it was just Tau shooting and Daemons assaulting. My Soul Grinder, through two turns of assaulting the bastion with 30 kroot, failed to crack the bastion and got destroyed by the hammerhead that came onto the table behind it. My LoC was killed by the shooting attacks of two full squads of stealthsuits that came onto the table behind him. Last night I fought game 1 of round three. Turns out my opponent for this round is also Tau. The mission this round is Seize and Destroy. Daemons defended and Tau attacked in this game. I used my Temple of Skulls as the central objective, which I must say is one of the best scenery pieces GW has ever done. For this battle, my strategy was simple, lots of PBs to swarm the objective. 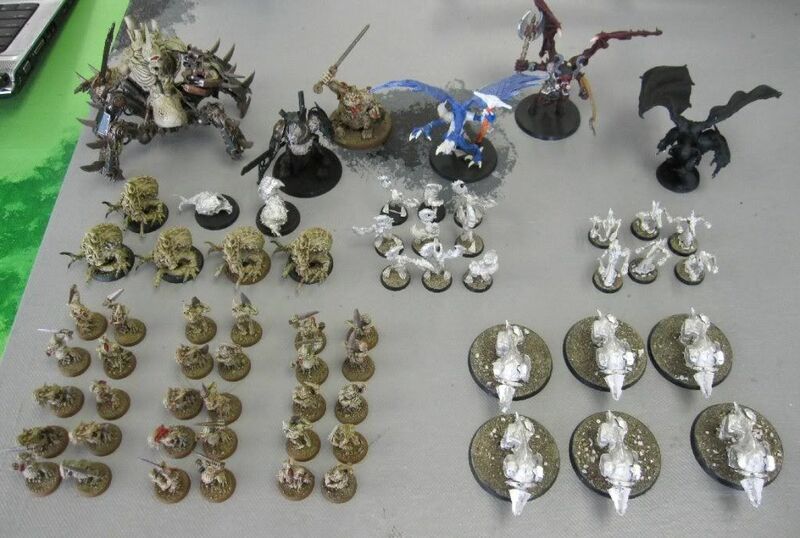 I took 4 squads of 12 PBs each, 6 BoN, 6 bloodcrushers, 3 daemon princes (2 with the mark of Nurgle and one with the mark of Slaanesh), 1 GUO, 1 Bloodthirster, 1 LoC, and my Nurgle Soulgrinder. I made my Daemonic Assault roll and got the half of the army I wanted which was all but the 4 PBs squads, the BoN squad, and the DP of Slaanesh. My plan was send in the big guys to cause as much havoc as they could and kill as much as they could. They were all cannonfodder IMO. With the 'Behind Enemy Lines' rule of the mission, I knew that my reserves would arrive later in the game and I was banking on it. With the PBs in reserve, they could not be shot at and I was hoping that there IS and FNP would keep them alive once they did arrive and I must say, it worked beautifully. My opponent tried desperately to kill the PBs, but as usual, they just refused to go down easy. I forgot my camera, so no pictures again to post. 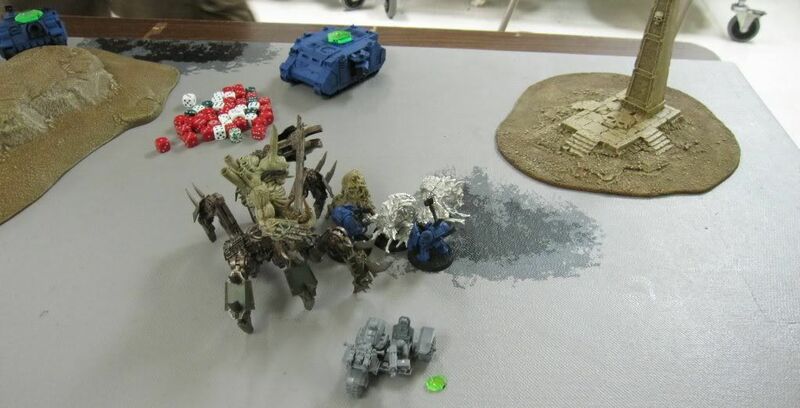 The biggest hightlight of the game was my LoC destroying two hammerheads using Bolt of Tzeentch and assulting a unit of crisissuits and winning after two assault phases. 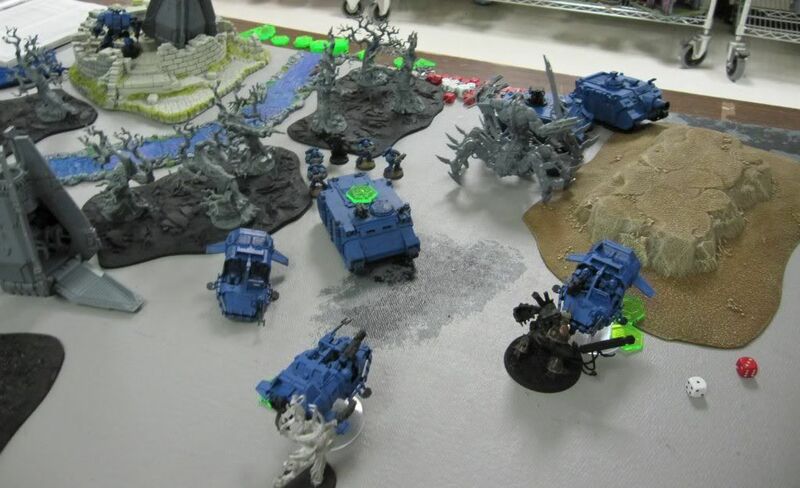 The bloodcrushers were a great diversionary unit as they got a very lucky DS very close to three units of crisissuits. It took two full turns of shooting from practically everything my opponent had to kill them which took attention away from everything else. 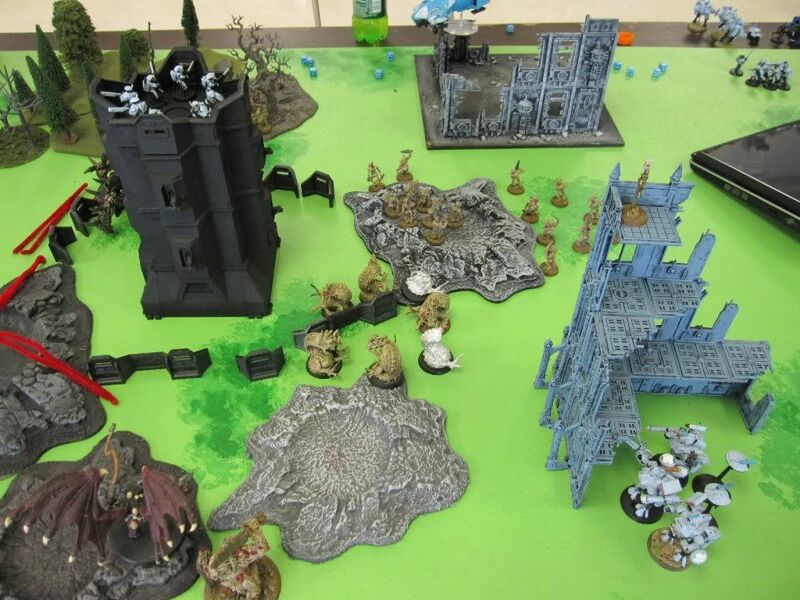 I have been using the Daemon World rules from WD when defending in this league just to make it more fluffy and this time the Plaguescape rule was rolled (each unit makes a toughness test and removes as many models as it failed the roll by). Even though daemons are normally immune to this, I made the rolls just like my opponent had to so that it would be more fair and it turned out to be costly on both sides. My opponent lost her HQ unit and was removing troops each turn. 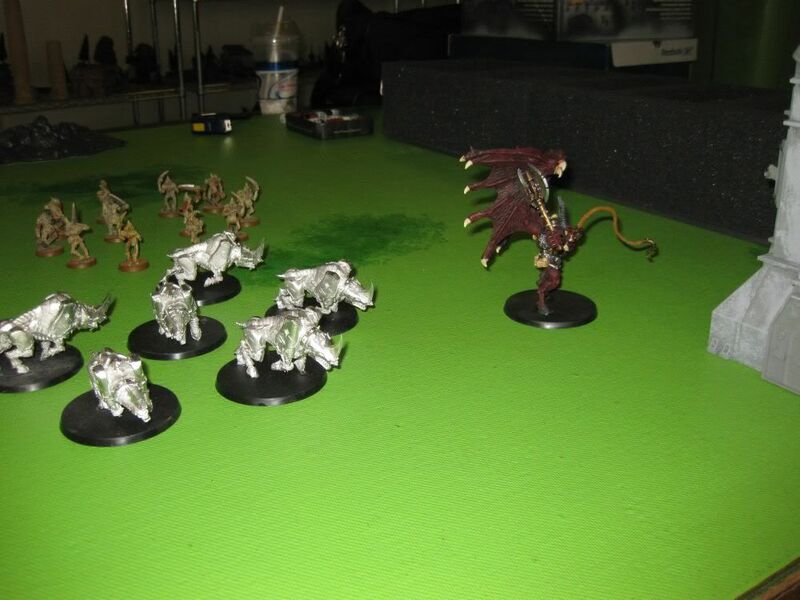 I ended up losing my bloodthirster (ouch), 1 DP of Nurgle, two BoN, 1 bloodcrusher, and a few PBs. Next week, I will have to face this mission as the attacker. I think it will be hard to win, but I have an idea. Just thought I would post some pictures from my Round 1 games. In addition to the ToFG, I am also playing my daemons in a Planetstrike League through my local chapter of the 40kFightClub. It started 4 weeks ago and in Round 1, I lost both games to Ultramarines, although they were both close battles. In this round, my opponent is Tau. Last night, we had to play the Desperate Assault mission and I was the defender. 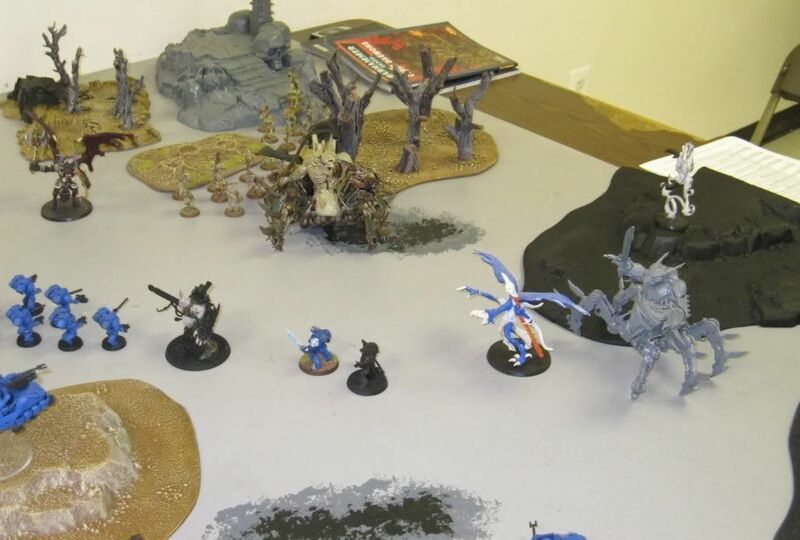 His army consisted of Commander Shadowsun, 3 hammerheads, 2 units of kroot, and lots of fire warrior and stealth suit squads. 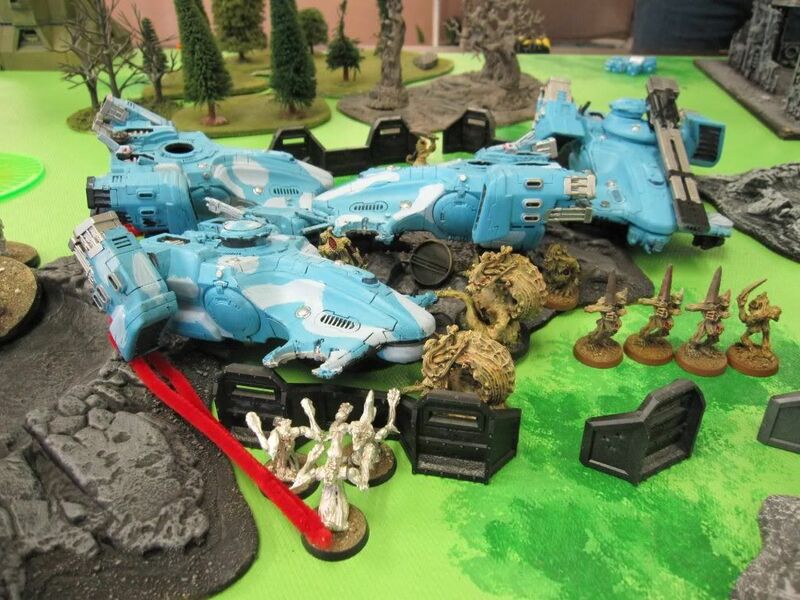 Unfortunately, I did not take notes during the game so I cannot write a detailed battle report, but mostly the game was me trying to weather the Tau shooting until I could assault. Anything that got assaulted by the daemons died and any daemons left out in the open got shot up, although my opponent was rolling badly on his hits and wounds and I was rolling good saves. I got the win by solely holding one objective and contesting the other three. Here are some picture from early in the battle (I did not take any later on). Below is a cool picture from the game going on next to mine. 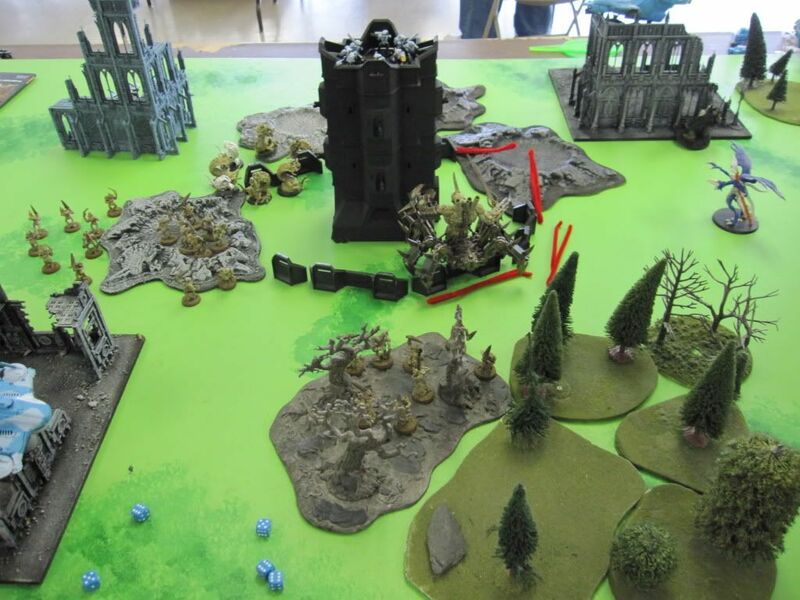 It was Orks attacking and Necrons defending.